where T is the temperature in kelvin and TΔS represents the total amount of energy that is absorbed by a system when its entropy increases reversibly. Gibbs free energy: ΔG = ΔH – TΔS. Goldfish are (equals sign) Horrible without (minus sign) Tartar Sauce. A helpful visual aid for conceptualizing Gibbs free energy is to think of it as a valley between two hills. Just as a ball would tend to roll down the hill into the valley and eventually come to rest at the lowest point in the valley, any system—including chemical reactions—will move in whichever direction results in a reduction of the free energy of the system. The bottom of the valley represents equilibrium, and the sides of the hill represent the various points in the pathway toward or away from equilibrium. This is shown graphically in Figure 7.11, which was also discussed in the previous chapter. Figure 7.11. Gibbs Free Energy and Spontaneity A decrease in Gibbs free energy indicates that a reaction is spontaneous. When an equilibrated system is disturbed, it will spontaneously act to restore equilibrium. Movement toward the equilibrium position is associated with a decrease in Gibbs free energy (ΔG < 0) and is spontaneous. When a system releases energy, it is said to be exergonic, as shown in Figure 7.12. Figure 7.12. Exergonic Reaction Profile Exergonic reactions release energy and are spontaneous (ΔGrxn < 0). Be careful not to confuse endergonic/exergonic (describing Gibbs free energy) with endothermic/exothermic (describing enthalpy). On the other hand, movement away from the equilibrium position is associated with an increase in Gibbs free energy (ΔG > 0) and is nonspontaneous. Such a reaction is said to be endergonic, as shown in Figure 7.13. Figure 7.13. 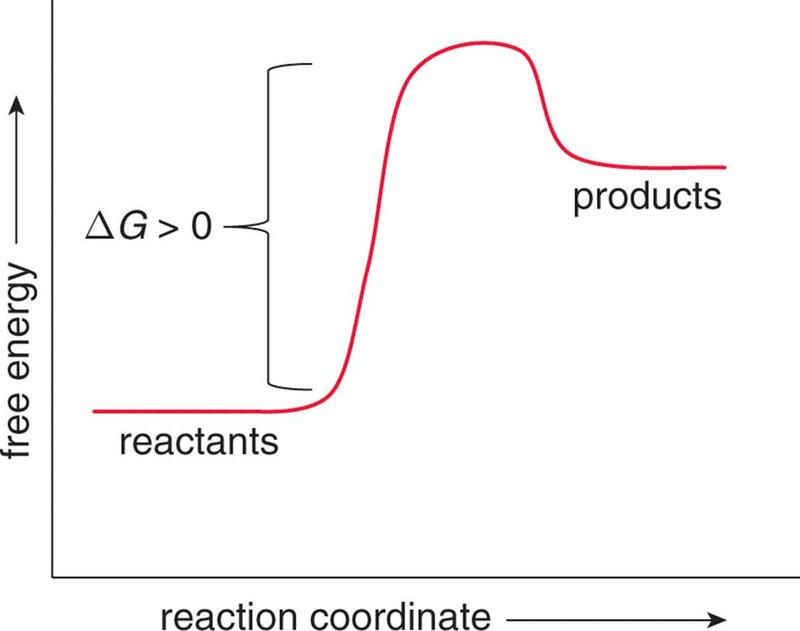 Endergonic Reaction Profile Endergonic reactions absorb energy and are nonspontaneous (ΔGrxn > 0). 1. If ΔG is negative, the reaction is spontaneous. 2. If ΔG is positive, the reaction is nonspontaneous. 3. If ΔG is zero, the system is in a state of equilibrium; ΔH = TΔS. Recall that thermodynamics and kinetics are separate topics. 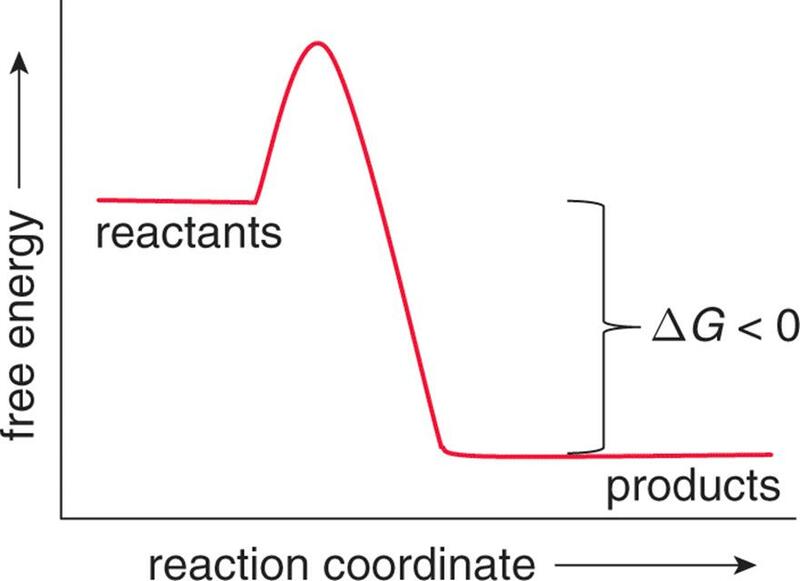 When a reaction is thermodynamically spontaneous, it has no bearing on how fast it goes. It only means that it will proceed eventually without external energy input. Because the temperature in Gibbs free energy is in kelvin, it is always positive. Therefore, the effects of the signs of ΔH and ΔS on the spontaneity of a process can be summarized as in Table 7.2. ΔG is temperature dependent when ΔH and ΔS have the same sign. Phase changes are examples of temperature-dependent processes. The phase changes of water should be familiar to you; have you ever wondered why water doesn’t boil at, say, 20°C instead of 100°C? When water boils, hydrogen bonds are broken, and the water molecules gain sufficient energy to escape into the gas phase. Thus, boiling is an endothermic process, and ΔH is positive. As thermal energy is transferred to the water molecules, energy is distributed through the molecules entering the gas phase. Thus, entropy is positive and the term TΔS is positive. If both ΔH andTΔS are positive, the reaction will only be spontaneous if TΔS is greater than ΔH, resulting in a negative ΔG. These conditions are met only when the temperature of the system is greater than 373 K (100°C). Below 100°C, the free energy change is positive, and boiling is nonspontaneous; the water remains a liquid. At 100°C, ΔH – TΔS = 0, and an equilibrium is established between the liquid and gas phases in such a way that the water’s vapor pressure equals the ambient pressure. This is the definition of the boiling point: the temperature at which the vapor pressure equals the ambient pressure. 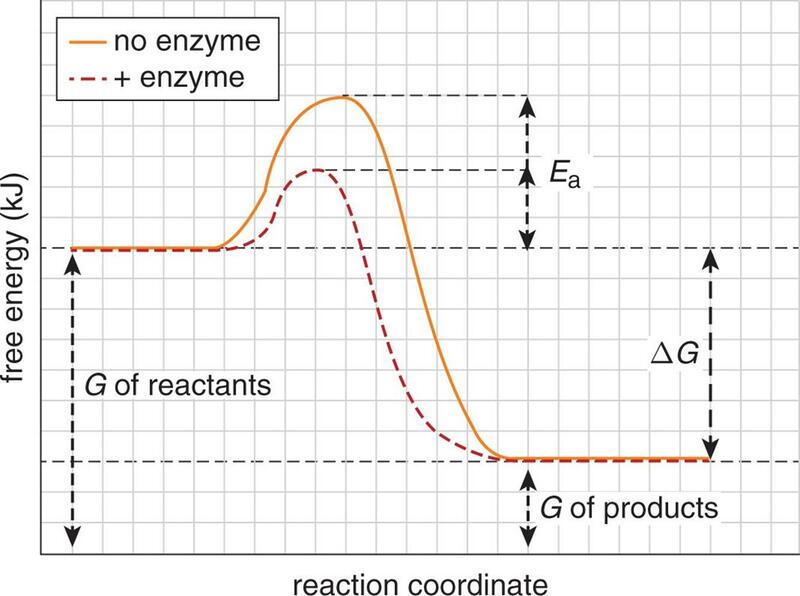 It is important to remember that the rate of a reaction depends on the activation energy Ea, not ΔG. Spontaneous reactions may be fast or slow. Sometimes a reversible reaction may produce two products that differ both in their stability (as measured by the change in the free energy associated with their production) and in their kinetics (as measured by their respective activation energies). Sometimes, the thermodynamically more stable product will have the slower kinetics due to higher activation energy. In this situation, we talk about kinetic vs. thermodynamic reaction control, which is discussed in Chapter 6 of MCAT General Chemistry Review. For a period of time after the reaction begins, the major product will be the one that is produced more quickly as a result of its lower activation energy. The reaction can be said to be under kinetic control at this time. Given enough time, however, and assuming a reversible reaction, the dominant product will be the thermodynamically more stable product as a result of its lower free energy value. The reaction can then be said to be under thermodynamic control. Eventually, the reaction will reach equilibrium, as defined by its Keq. Note that the right side of this equation is similar to Equation 7.12. The use of the Q indicates that the system is not at equilibrium. 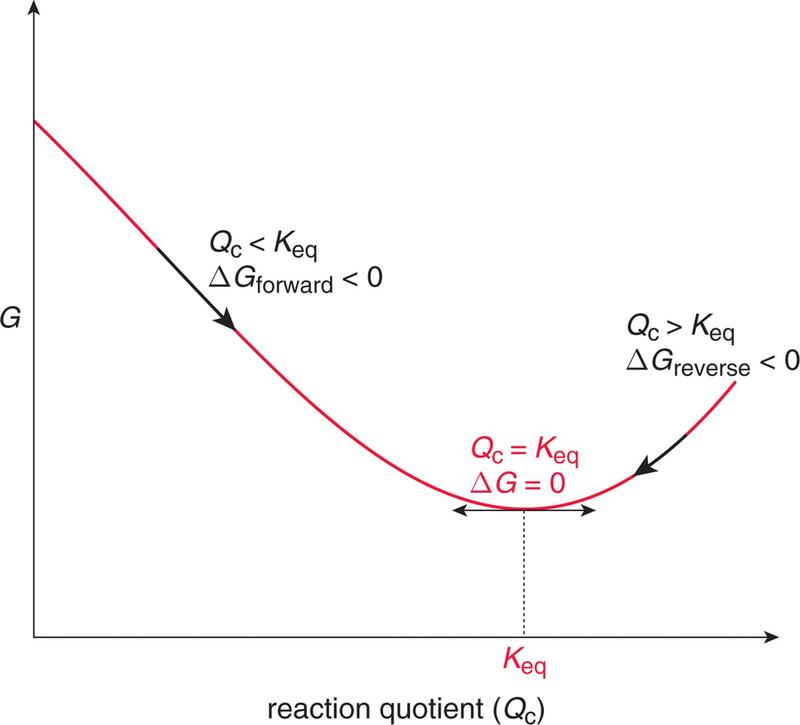 As described in Chapter 6 of MCAT General Chemistry Review, if the ratio of is less than one (Q < Keq), then the natural logarithm will be negative, and the free energy change will be negative, so the reaction will spontaneously proceed forward until equilibrium is reached. If the ratio of is greater than one (Q > Keq), then the natural logarithm will be positive, and the free energy change will be positive. In that case, the reaction will spontaneously move in the reverse direction until equilibrium is reached. Of course, if the ratio is equal to one, the reaction quotient is equal to the equilibrium constant; the reaction is at equilibrium, and the free energy change is zero (ln 1 = 0). Reaction profiles of free energy can be altered by the presence of catalysts. While the overall free energy change of the reaction is not altered, the activation energy required to accomplish the reaction is reduced significantly in the presence of a catalyst, as shown in Figure 7.14. 2. At what temperature would the reaction described above be at equilibrium? 3. If you were to suddenly flood the reaction vessel with significant amounts of ammonia, what would occur?